No one ever accused Steve Jobs of being too nice. "Bill [Gates] is basically unimaginitve," Jobs said of his Microsoft rival, "and has never invented anything, which is why I think he's more comfortable now in philanthropy than technology." Some have leveled this exact same criticism at Jobs who is not credited with inventing the touch screen, the portable personal music player, or tablet - some would even say that the Apple computers are essentially an adaptation of Xerox's PARC. So what did Jobs invent? In what way was he more imaginitive than Gates? Jobs's unique contribution actually falls more in the realm of style. Before Steve Jobs, computers were boxy chunks of greyish-tan plastic that were tethered to your desktop, and cell phones looked like building blocks. 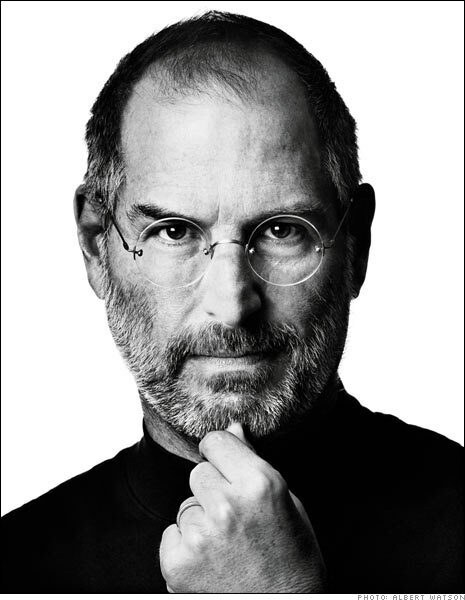 Jobs's study of literary classics, Asian calligraphy, his international travels to such countries as India, and his affinity for the humanities, as documented by Steve Jobs biographer Walter Isaacson, all combined to bring a newfound artistry to the technological tools so many of us rely upon. Computers became sleek slivers of stainless steel; phones and tablets light and slim. In his personal life, Jobs maintained that same sense of design integrity, polishing the plans to his corporate jet (insisting on brushed stainless steel and single buttons that toggled), wearing trim black turtlenecks (a lifetime supply designed by Issey Miyake), and refusing to put on a mask at the hospital because he didn't like the cut of it. Isaacson uses terms to describe Jobs that we rarely hear when discussing technology gurus - terms such as "romantic" and "poetic." His favorite color was said to be simple white. His stores are streamlined experiments in glass, concrete, and yet more stainless steel. Even the staircases are geometric strands of DNA, perfect, clean coils. Isaacson calls this style "techno-Zen." In fact, Jobs himself describes his computers as looking as though they were from "another planet...a planet with better designers." It is even said he once went so far as to hire Miyake to design an Apple uniform. Isaacson concludes his biography by asking a simple question about Jobs: "Was he smart?" "No, not exceptionally," Isaacson answers himself. "Instead," he goes on, "[Jobs] was a genius. His imaginitive leaps were instinctive, unexpected, and at times magical. He was, indeed, an example of what the mathematician Mark Kac called a magician genius, someone whose insights come out of the blue and require intuition more than mere mental processing power. Like a pathfinder, he could absorb information, sniff the winds, and sense what lay ahead." I might add that this magical thinking was highly influenced by artistry and principles of design. These properties, more so than the technological advances made by Apple, distinguished the Jobs product from any other on the market and created legions of loyal Apple fans eager to own the coolest trends, the latest styles in personal computing. As Isaacson explains, Jobs was a "master at putting together ideas, art, and technology in ways that invented the future." In other words, his principle contribution was the marriage of technology and art. "Using an Apple product," Isaacson tells us, can be as "sublime as walking in one of the gardens in Kyoto that Jobs loved" so very much.